Today is posting day for Secret Recipe Club‘s Group C! Secret Recipe Club is a group of rabid food bloggers that are kept in line by some truly marvelous hosts: Jane, Sarah, Suzanne, and the fabulous Group C host, Debbi. Each month the membership receives a “secret pal” and must choose something from the assigned site to make and post about. We all have sites that we visit often and are wowed by time and time again. For me, that blog is The Kitchen Witch. This is the second time I was assigned Rhonda’s site. The first time was way back in September 2011. I have been an avid reader ever since. Obviously, I was starry-eyed thrilled when I got Debbi’s email telling me that Rhonda would be my assignment for May. Let the lovefest commence because I heart this gal. She’s my idol. I will try not to gush too much but if you want to read about Rhonda’s hipness and coolness, click here. Since I sang her praises originally in 2011, Rhonda has most recently upped her food goddess-like status and has opened a cafe! She rocks and I want to be just like her. I have made many things from Rhonda’s site but I wanted to do something brand spankin’ new this time around. 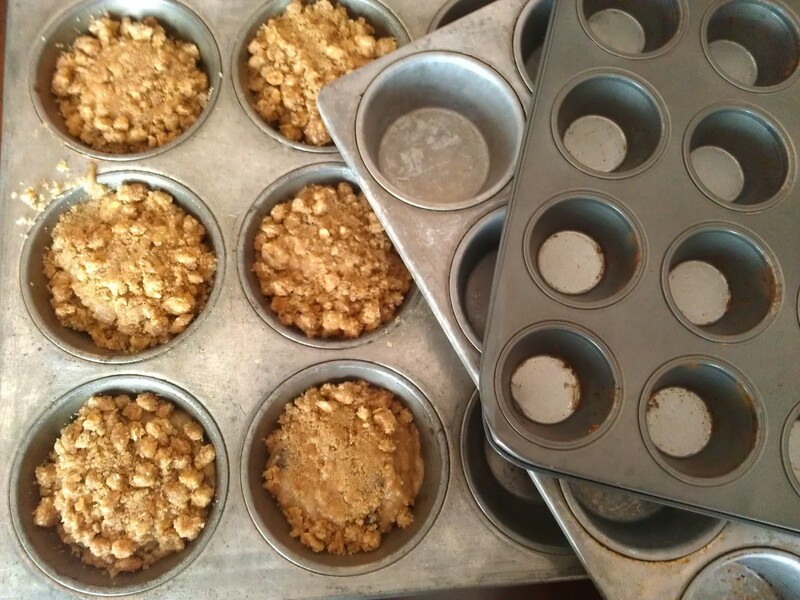 Preheat oven to 375 F. Lightly grease muffin tins or line with muffin paper liners. In a mixing bowl, whisk together 1 1/2 cups flour, baking soda, baking powder and salt. In the bowl of a stand mixer, beat together bananas, sugar, egg and coconut oil. Carefully mix the banana mixture into the flour mixture until just moistened. Then, by hand, stir in 1 cup of granola and chocolate chips. Do not over mix. Spoon batter into prepared tins, filling them 3/4 full. Make topping. In a small bowl, mix together the butter, granola, flour, brown sugar and cinnamon. Sprinkle topping over muffins. Bake in the oven for 18 to 20 minutes, until a toothpick inserted into the center of muffin comes out clean. NOTE: I would normally advocate the use of homemade granola for a recipe such as this, but the truth was I didn’t have any on hand and I was able to score a free box of Simply Made granola at Target. Forgive me, but this gives me the opportunity to make this again with homemade! My mom recently visited and she always brings me some garage sale finds. This time around she brought me a food mill and this gargantuan muffin tin. I could think of no better way to break in this pan as to baptize it with these great muffins! The only changes I made to Rhonda’s original recipe was to replace the originally called for butter in the muffin batter with coconut oil. I also used whole wheat flour. 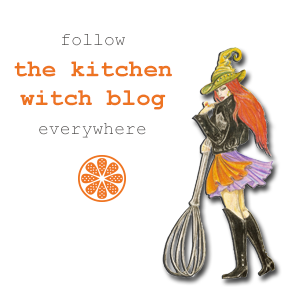 I hope that you take a gander at The Kitchen Witch. I know you will become a fan as well. Thanks, Rhonda, for another absolutely fabulous recipe. Lately I have been obsessed with anything granola! These muffins look scrumptious, Debra. I love granola too and this topping is fantastic. Thanks, Angie! Thanks for the very kind kudos about the pics. 🙂 Loved that nutter butter banana pie you posted. Seriously over-the-top (in a good way)! thank you! Someone said she’d use chocolate cool whip and I do think some chocolate added to it would be awesome! Talk about over the top. Kinda funny that we both made banana goodies for SRC. Great minds. Oh and I noticed you weren’t linked up when I was blog hopping so I went ahead and added you…hope you don’t mind. So, that is how that happened! LOL. I was sitting in a drive thru trying to frantically add it on my phone. I was having issues but when I got to work, it was magically there. You’re a peach! I miss my old group from the SRC!!! I need to pop over to visit Rhonda…still catching up from a long weekend in Miami. 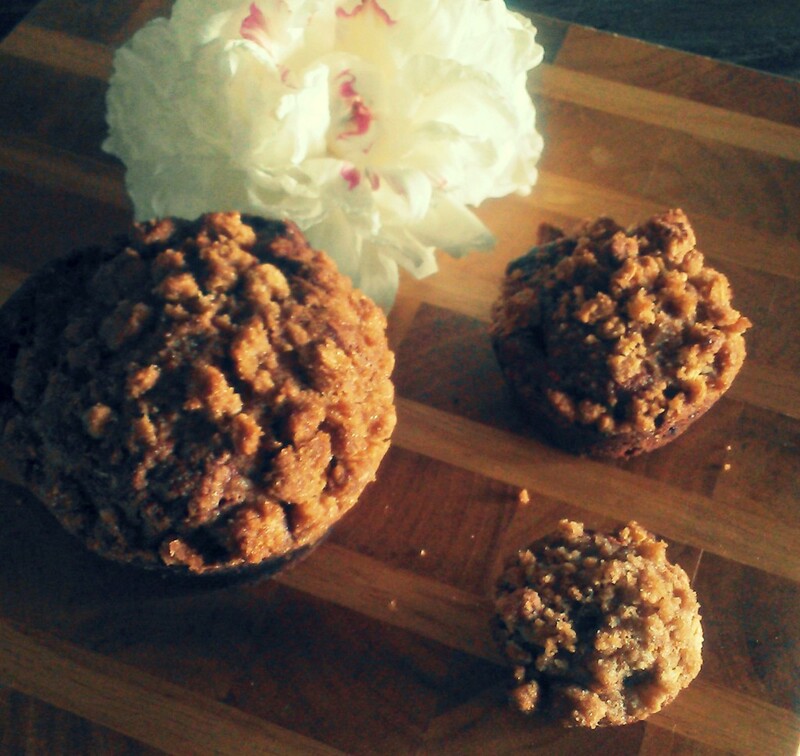 You picked out two great recipes…love the addition of granola to the muffins and the topping. Hope you had a fun trip! We miss you too, Liz. Wow, these look so yummy! I know my little guys would love these. Thanks, Jamie. I think I was more partial to the mini ones and they would be great with mini chocolate chips for the little guys! The streusel topping is definitely the best part! I already follow the Kitchen Witch. So you did luck out with representing her. I don’t think I have seen a muffin that incorporates granola in the mix and on top. I LIKE IT. Ways to use over ripe bananas are always welcomed, particularly in the warmer weather when they are more likely to get out of line. I freeze my bananas whole if they get too gnarly before I can use them. I think I saw on Mind of a Chef that one of the pastry chefs from Momofuku WANTS her bananas really gnarly and liquidy for her banana creme pies. Yes, please. Love muffins and these look perfect! I love baking muffins. These are new favorites ’round here. These look amazing Debra, love the crunchy topping. Bananas and chocolate are a magical combination. This topping is magical, Chris. Thanks. These muffins are the bomb! Need to make them soon. Glad to be part of SRC group C with you! Definitely da’ bomb! Thanks for stopping by. A perfect breakfast on the go! I love this Muffins look absolutely georgeous!! Definitely will be checking out Rhonda’s blog and those recipes you list. These muffins looks pretty darn awesome! Thanks, MJ. I am going to add this topping to lots of things. I was out of town yesterday and then was assisting on knife skills class so I didn’t get a chance to peruse the SRC reveals yet. Imagine my glee when I saw you got my blog again!!!! The trio of sizes is adorable! So I keep asking myself when am I going to get assigned your blog? Although I’d be paralyzed trying to narrow a recipe down!. You are the best! See? Assisting with a knife class? You rock. Thanks for a great recipe, Rhonda, that is definitely a keeper! I would love for you to be assigned EEs!!! Rhonda does have some amazing amazing recipes – love the idea of granola topping on a banana chocolate chip muffin. My daughter loves to make muffins so we’ll be checking these out for sure! Yes, yes, she does and this is one of the best ones! I love love LOVE the Kitchen Witch Blog! Those muffins? They look magical to me! I just pulled the last two from the freezer for breakfast. Bonus: They freeze well too. 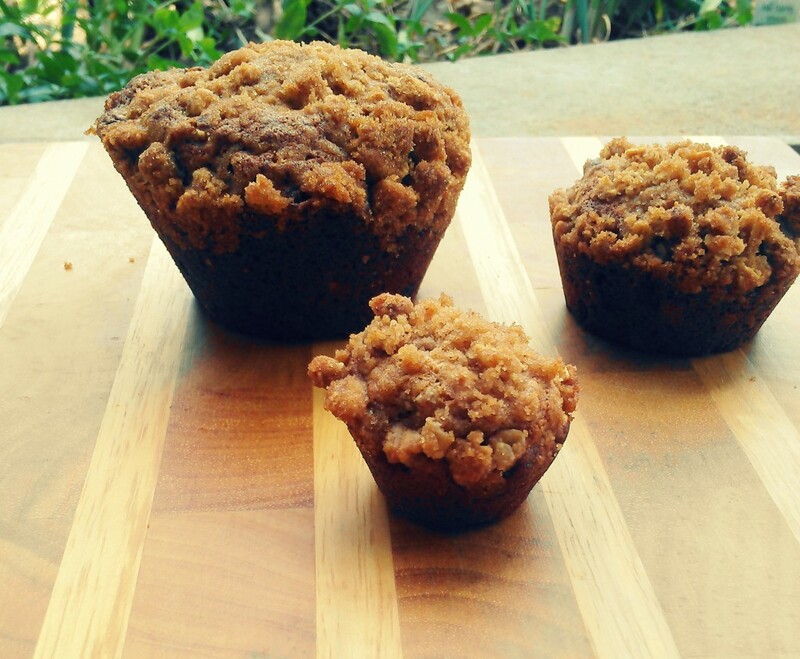 Topping these muffins with granola is such a great idea! Thanks for a great recipe. Thanks, Andi. These are really hearty and they have chocolate included!